I admit that when I was pregnant with my oldest daughter, I didn't fully realize that there were options besides the hospital, when it came to giving birth. At least, I didn't realize that it was an option for me. My sister-in-law had given birth at home, to my nephew, a couple of years before I became pregnant, so I knew that it was possible, but the thought never crossed my young, just out of college, pregnant mind that it was a possibility. My first prenatal appointments were with one of the top obstetrical clinics in Seattle — at the top of a high-rise building in the middle of the Hospital District that was lovingly known as Pill Hill to locals. In other words, the topic of giving birth anywhere but in a hospital never came up and was never presented to me as an option from my doctor and I never pursued it. There was a time in my life where I thought that this would be my career and that it was my passion and in an odd way, in retrospect, being a patient was the next best thing. Being pregnant at 23 years old, I had just graduated from college a year earlier, with the intention, once upon a time, of becoming an obstetrician myself. I wanted to be a doctor; I wanted to help women bring babies into the world and I wanted to do it in the setting of a hospital. Although my career path changed along the way, when I became pregnant, I couldn't wait to start my appointments — not only to see my baby via ultrasound and to hear her sweet heartbeat for the first time — but, also to experience the clinical side of pregnancy. I looked forward to sitting in waiting rooms covered in ugly upholstery being surrounded by doctors who were in scrubs. There was a time in my life where I thought that this would be my career and that it was my passion — and in an odd way, in retrospect, being a patient was the next best thing. 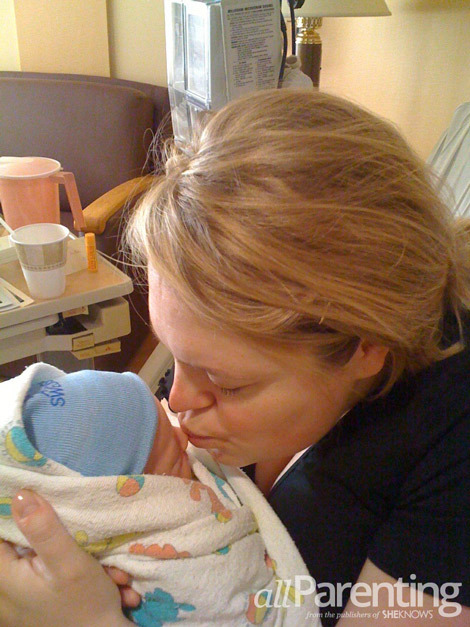 Now, being nearly nine years past my first birthing experience, I often look back at my giving birth in the hospital and wonder if I would have done it differently. While giving birth in the hospital was not the warm, personal experience that many mothers hope to create for their child's entrance into the world, I can't say that my own personality would lend itself to anything but a hospital birth. One of the biggest sources of stress, when I was in the last months of my pregnancy, was considering who was going to be at the hospital, or in the room as I was in labor. Having just moved closer to both of our families, I was so concerned about family members and friends being present during some very personal, private moments — ones that I wanted to share with my husband, and my husband alone. I was thankful for the privacy that a hospital birth allowed us — taking the birth out of our home and into a more neutral territory for the arrival of our first daughter. There were moments in my first pregnancy, especially, where even choosing the right kind of diapers felt so consuming that I cannot imagine preparing all the necessities for a home birth as well. I greatly admire women who give birth at home, not only for their commitment to bring their babies into the world the way they envision, but for the prep and planning that it takes to have a home birth. The thought of planning, not only mentally for becoming a mother, but for giving birth in my home, would quite possibly drive me off of the pregnancy deep end. There were moments in my first pregnancy, especially, where even choosing the right kind of diapers felt so consuming (blame it on pregnancy brain!) that I cannot imagine preparing all the necessities for a home birth as well. During my second pregnancy, I was diagnosed with placenta previa, a condition where my placenta was covering the opening to my cervix. This lead to delivery via emergency C-section when my daughter, Meg, was just over 34 weeks along. Having a C-section was something that I was expecting, but no matter how many friends told me about their experience or how many books I read about what a C-section is really like, I was unprepared. Despite not having the choice to have anything but a hospital birth, at this point, I recall feeling so thankful to be in the hospital where I knew that the health of my premature daughter, and my post-surgery body were being taken care of. I was thankful to have the time to truly rest my body and my mind during my hospital stay, post-C-section — all while being able to be close to Meg, who was in the NICU. Despite not having the choice to have anything but a hospital birth, at this point, I recall feeling so thankful to be in the hospital where I knew that the health of my premature daughter, and my post-surgery body were being taken care of. By the time our third child was born, I was far more educated on the possibility of giving birth at home, or somewhere besides the hospital, such as a birthing center. I chose to have our son in the hospital and chose to deliver via C-section, so that I could have a tubal ligation simultaneously. While my experience with this C-section was anything but nice (blame it on a new spinal/pain medication combo that didn't quite work), I am thankful that the option was available for me to choose — eliminating the need to go back into surgery to have my tubes tied at a later date. I realize that giving birth in a hospital isn't for everyone and I fully respect that each woman gets to make her own choice in the way that she decides to give birth to her children. This is simply my story and experience on why I'd only give birth in a hospital.